It is true that you would consume less of some vitamin-rich foods like fruit and grains, especially during Atkins Induction (Phase 1 of the diet). But you would get more proteins, amino acids and healthy fats. And you can get all the vitamins and minerals you need from low-carb foods. Should you take supplements on Atkins Diet? Although it is possible to get the full spectrum of nutrients on Atkins without resorting to supplements, many dieters choose to do so anyway. First of all, supplements like multivitamins and electrolytes do provide cheap insurance against deficiencies. Let’s face it, most of us don’t have the time to create perfectly balanced meals from scratch every day. Secondly, supplements can give you additional benefits on top of simply preventing deficiencies. For example, they can boost your energy, help to reduce Atkins flu or improve your sleep quality. What did Dr Atkins have to say about supplements? Dr Atkins himself was a strong advocate for targeted supplementation. In addition to this chapter in his original book, Dr Atkins wrote a separate book on the potential medicinal benefits of vitamins – Dr Atkins’ Vita-Nutrient Solution. He devised his own multivitamin/multivitamin formula, called Atkins Basic #3 Formula. Here’s a quick summary of supplements recommended by Dr Atkins in his original book. Atkins Induction (Phase 1) is the most restrictive phase of the diet. Your carb intake is limited to under 20g net carbs a day. Fruit and berries are out. You can only have a few cups of very low-carb salad vegetables. A high-quality extra-strong multivitamin can help to minimise the shock of the sudden change in your nutritional profile. It will also help to maintain your energy levels and may reduce cravings for high-carb foods. Many people feel tired during the first phase of Atkins, before ketosis kicks in – the infamous “Atkins flu”, also sometimes referred to as “Induction Flu” or “Keto Flu”. You may get fatigue, headaches, muscle cramps and heart palpitations. Electrolytes (magnesium, potassium, sodium) supplements can help you beat these symptoms. Another common problem during Induction is sugar cravings. Dr Atkins recommended chromium picolinate and green tea extract to reduce cravings. If your metabolic resistance is high, Dr Atkins also recommended Co-Enzyme Q10 and L-Carnitine to boost fat-burning metabolism and speed up the transition to ketosis. As you start adding foods back, your nutrition will be more varied. There will be less need to supplement. But if you still get problems like tiredness or sugar cravings, then continue taking multivitamins and other supplements listed above. After several weeks on Atkins, some people get constipated. The reason for that is a possible fibre deficiency (grains being one of its main sources). Prevent this unpleasant side effect by taking a fibre supplement. Dr Atkins recommended flaxseeds and psyllium husks as the optimal fibre supplement on Atkins Diet. Dr Atkins also strongly recommended essential fatty acids to support heart health over the long term. These are usually available in form of omega oil capsules. Maintenance phase allows most foods, except for highly processed carbohydrates such as refined sugar and white flour. By this stage, you will be well adapted to low-carb lifestyle and most likely won’t need any additional supplements. But if you experience any issues, like tiredness or Atkins flu symptoms, you could always go back to supplements as and when required. What is Atkins Basic #3 Formula? Atkins Basic #3 Formula was designed by Dr Atkins specifically to compliment Atkins diet. The formula included 30 different vitamins and minerals with super-strong B, C and E vitamins. It also contained chromium, selenium and green tea extract. Unfortunately, Atkins Nutritionals no longer produce Atkins Basic #3. The company has changed hands many times since Dr Atkins’ death. Their marketing strategy changed accordingly. However, many dieters still use Atkins Basic #3 Formula as a guideline for how to supplement their Atkins Diet. You can view the full list of ingredients for Atkins Basic #3 in his original book. If you are looking for a similar product, please check out Nutri-Align Multivit – the best-selling multivitamin formula for low-carb and Keto dieters, with a similar composition to Atkins Basic 3. High-quality multivitamins similar to Atkins Basic #3 – for example, Nutri-Align Multivit – to ensure full intake of nutrients, improve energy levels and reduce sugar cravings. Omega oil capsules including fish oil, flaxseed oil and borage oil, to improve blood circulation and protect arteries from forming plaque. Chromium Picolinate to normalise blood glucose levels, aid body recomposition and lower cholesterol levels. Co-Enzyme Q10 and L-Carnitine – if your metabolic resistance is high, these nutrients can assist fat-burning metabolism and speed up your transition to ketosis. Flaxseeds and psyllium husks to ensure healthy digestion and prevent constipation. Unfortunately, branded Atkins supplements are no longer available, as Atkins Nutritionals stopped producing them. You can buy some of the supplements mentioned above from our online shop. Still worried? Take a multivitamin that’s been designed to support low-carb diets like Atkins, to bridge any potential gaps and give you complete peace of mind. 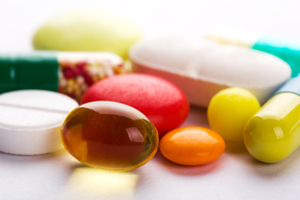 You could purchase most of these supplements from High Street health shops or pharmacies. Just one note of caution regarding multivitamins. Most cheap brands won’t provide you with the full list of nutrients as recommended by Dr Atkins. Typically, they will only include 100% of NRV (which isn’t sufficient). They probably won’t be iron-free or sugar-free. Most likely, they won’t include any of the extra recommended ingredients. So always read labels carefully and check Dr Atkins recommendations. What about the revised version of the book? In the latest revision of the Atkins Diet book, published in 2010, supplements are only mentioned briefly. The authors advise taking an iron-free multivitamin/multimineral formula, including magnesium and calcium, and an omega-3 supplement. Are there any studies to back up Dr Atkins’ recommendations? Since Dr Atkins’ book was written, numerous scientific studies confirmed the validity of his recommendations. Some examples are listed below. Anderson RA. Nutritional factors influencing the glucose/insulin system: chromium. J Am Coll Nutr. 1997 Oct; 16(5):404-10. Julija Josic, et al. Does Green Tea Affect Postprandial Glucose, Insulin and Satiety in Healthy Subjects: A Randomized Controlled Trial; J Nutr. 2010 Nov.
Amino Acids. 2011 Jul;41(2):507-15. doi: 10.1007/s00726-010-0770-5. Epub 2010 Oct 21. Effects of oral L-carnitine supplementation on insulin sensitivity indices in response to glucose feeding in lean and overweight/obese males. Galloway SD, Craig TP, Cleland SJ. Nutr J. 2012; 11: 110. Published online 2012 December 14. doi: 10.1186/1475-2891-11-110, PMCID: PMC3545984 Participant experiences from chronic administration of a multivitamin versus placebo on subjective health and wellbeing: a double-blind qualitative analysis of a randomised controlled trial, Jerome Sarris et al. I’m disappointed that the Atkins Basic 3 vitamins are no longer being manufactured. What similar supplement is on the market? Hi Mary Jane, I agree, it is very disappointing.